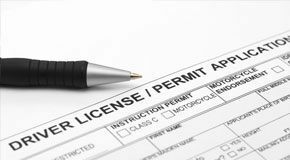 If you don't have a learners permit you will need one before you start your driving lessons. This will mean a visit to the NDLS centre. It’s the organisation which now receives applications and then issues learner permits and driver’s licenses. With the sheer size of it having an Irish driving licence in Cork has become a necessity. Driving schools are popping up everywhere, some are good and others don’t make the grade. Your biggest challenge is finding the one to get you through. So you trawl your way through internet. You type in terms like 'Driving Lessons Cork' or 'The Best Driving School in Cork'. Well now you've landed, please take a look around at what we do, how we do it and what our students say about us. We don’t expect you to believe us when we say the RSA School of Motoring has the best results in Cork, or that we claim 25 years of solid experience. 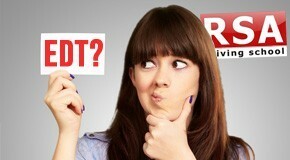 You need impartial, objective evidence, and you’ll find this in our videos and successful student testimonials. At School was the place where we had knowledge drummed into us that was mainly useless when we wanted our first job. Experience is what matters, and that's equally true when it comes to passing a driving test. We don’t teach you. Instead you learn as we guide you through the process. What’s more we offer you a buffet of opportunities to choose from too. Driver training - or ‘mentoring’ as some call it - is most effective when interpersonal chemistry is right. That’s why we have the widest selection of expert instructors to choose from, including gentlemen, ladies, and adults of all ages. But that’s not the end of your options by any means. Your choice of practising in a manual or automatic should match the car you are planning to do the test in. Should you change your mind don’t stress. You’ll find we’re flexible. Want automatic driving lessons in Cork? Give us a call. We also have the reputation of being Cork’s pre-test experts specialising in ‘mock exams’. These present the same conditions as the real thing. There is nothing better than being prepared and nothing like our pre-tests. We don’t expect you to come to us. We come to you instead, and that’s anywhere you happen to be at the time. Our only requirement is a suitable stretch of road. However please notethis excludes test route familiarisation. 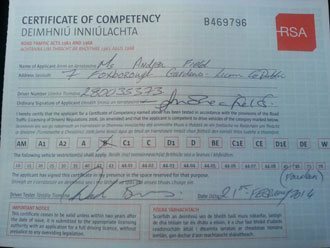 We areCounty Cork’s Essential Driver Training Specialists and we designed our RSA School of Motoring curriculum to get you through your driver’s licence test first time - that’s just after you absorb the expert knowledge we impart to you. Finally, we have an easy payment plan that empowers your family, your friend and even your employer to contribute towards your driver training fees as a loan you can repay or even as a gift. Our mission is to get you through. You came here to discover whether we are your Cork driving school of choice and by now you are getting closer to the answer! The clincher is we teach you not one, but two essential things. These are learning safe driving techniques while using real time, actual scenarios you participate in, and then explaining how to cope on your testing day so you get top marks, and the right to drive in Cork too. We do these things while you watch, and we are with you every inch of the way. This includes revealing actual stretches of roads examiners use, and pointing out what to anticipate and how to deal with it. And that’s not all. We cover the other three aspects of the test too. That’s because our goal is teaching you safe driving skills so you pass. Or else, what’s the point? When you're on lesson it is easy to feel calm and confident...but let’s face it nobody feels relaxed while they wait for the examiner to call them in. But you will feel calm after we put you through our comprehensive test simulations and reveal what the tester will be thinking and what to expect on the day of the test. Being successful means knowing that you are the best, and going out and winning. Successful football teams score because they are on top of the mind game thanks to their coaches. So let us be your driving coach whose job is making sure you suceed in getting your driving licence. WHEN YOU HAVE THE INSIDER EDGE LIKE THAT YOU WIN! So just to recap quickly … there’s no guarantee you are going to pass just because a driving school has a website with words that are full of promises but empty of proof. Did you examine our pupil testimonials and watch our unrehearsed videos yet? Confirmation of our sincerity just does not get better. Be careful – very careful - when someone tells you driver training is similar everywhere but you must go with them for some or other reason they think up. Googling ‘the finest driving school in Cork’ may have got you to this page, but it’s the skills that we describe here that are going to get you through the test. SO YOU TAKE ME ALL THE WAY TO SUCCESS? That’s exactly right. We teach you to drive and we teach you to drive safely. Then we take things a step further and put you through a pre-examination driving test with exactly the same challenges the government one makes. 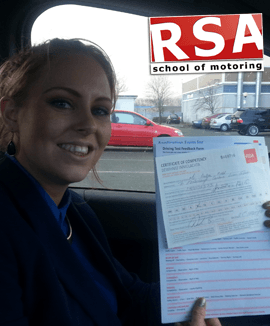 After you pass with flying colours then you know that you are going to succeed, because you have the confidence that only the RSA School of Motoring brings to County Cork. So now you know that there’s only one Cork driving school worth considering, the next step is up to you. We can teach you to drive and we can help you pass your driving test but only you can start the process. When you are sure that you want to do this (and you really want the freedom a diving licence brings) then simply click here. We will make sure that the rest happens, and that the process is enjoyable.